Danish modern mouth blown art glass vase with mulberry colored bubbly landscape like pattern on opaline white glass. Manufactured by Danish glassworks Holmegaard in the 1960s. Mint condition. About the manufacturer: The history of Holmegaard begins in the early 1820s, when Count Christian Danneskiold-Samsøe seeks permission from the King of Denmark to establish a glassworks at Holmegaard Mose in the town of Næstved on Southern Sealand in Denmark. Sadly, the Count died before he could get a reply from the King. Instead, his daughter Countess Henriette Danneskiold-Samsøe pursued the project and got permission to launch in 1825. The Countess made sure to bring on Bohemian glassworkers, and the story of Holmegaard continued to be a story of small glassworks and many different artists coming together to shape the vast production that would create the glass tradition that Holmegaard is still famous for across the globe. This graceful Holmegaard vase in a clear sky blue would add a sparkly accent anywhere in your home. Designed by Per Lutken. 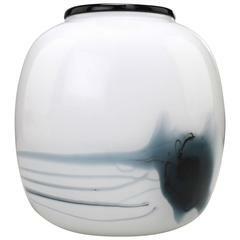 This smokey glass Labrador vase was designed by Per Lutken for Holmegaard in the late 1950s. Produced until the early 1960s. Engraved or signed 'Holmegaard' to the bottom. Set of two big iconic glass Scandinavian Holmegaard Kastrup gulvases designed by Otto Brauer, Denmark 1960s, extra large sizes.